A long and low race rig that can handle the Pavé and Strada Bianca just as well as the road. 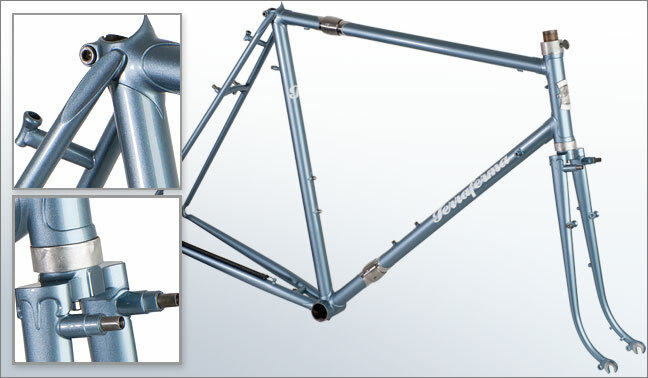 Optimized for 700 x 28-32c tires with clearance and eyelets for fenders and braze-ons for Paul Racer M or MAFAC brakes. Can be specced as a go fast 700C randonneur (trail will be lower to accommodate a full Rando bag). The optional imperial blades and low french style rake provides not only unequaled comfort but also a degree of suspension that will keep your tire glued to the crappiest of road surfaces.